Lech Poznań were the defending champions, having won their 7th title last season. Zawisza Bydgoszcz and GKS Bełchatów finished in 15th and 16th place, respectively, and were relegated to the I Liga as a result. Zagłębie Lubin, the 2014–15 I Liga champion, returns to the top level just one year after their relegation. Runners-up Termalica Bruk-Bet Nieciecza was promoted to the Ekstraklasa for the first time. ^ Termalica played 7 first home games at Stadion Stali Mielec (cap. 6,864) in Mielec. Rules for classification: 1) Points; 2) Head-to-head points; 3) Head-to-head goal difference; 4) Head-to-head goals scored; 5) Head-to-head away goals scored (only if two teams); 6) Goal difference; 7) Goals scored; 8) Fairplay ranking; 9) Draw. (Note: Head-to-head record is used only after all the matches between the teams in question have been played). ^ a b Head-to-head record: Zagłębie - Cracovia 4–2, Cracovia - Zagłębie 1–2. ^ Lechia Gdańsk were punished with a deduction of one point for failing with licensing requirements. On 8 April 2016 the punishment was suspended by Polish Court of Arbitration for Sport. On April 11 an appeal against the original decision was withdrawn by the club. ^ a b c Head-to-head record: Lechia 7 points, Ruch 5 points, Podbeskidzie 3 points. ^ Ruch Chorzów were punished with a deduction of one point for failing with licensing requirements. 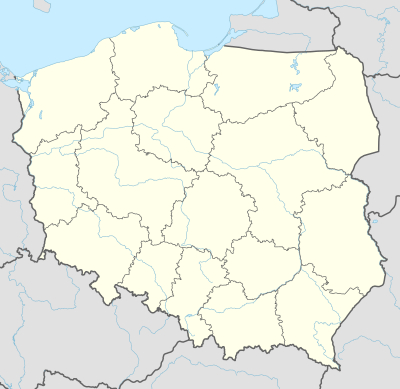 ^ Wisła Kraków were punished with a deduction of one point for failing with licensing requirements. ^ Górnik Zabrze were punished with a deduction of one point for failing with licensing requirements. Rules for classification: 1) Points; 2) Points in regular season; 3) Head-to-head points in regular season; 4) Head-to-head goal difference in regular season; 5) Head-to-head goals scored in regular season; 5) Head-to-head away goals scored in regular season (if only two teams); 7) Goal difference; 8) Goals scored; 9) Fairplay ranking; 10) Play-off (only if needed to decide champion, teams for relegation or teams for UEFA competitions). ^ Legia Warsaw qualified for the Europa League second qualifying round by winning the 2015–16 Polish Cup. However, since they already qualified for European competition based on their league position, the spot awarded to the cup winners was passed down the league. ^ Lechia Gdańsk were punished with a deduction of one point during regular season for failing with licensing requirements. On 8 April 2016 the punishment was suspended by Polish Court of Arbitration for Sport.On 11 April 2016 an appeal against the original decision was withdrawn by the club. ^ Ruch Chorzów were punished with a deduction of one point during regular season for failing with licensing requirements. ^ Wisła Kraków were punished with a deduction of one point during regular season for failing with licensing requirements. ^ Górnik Zabrze were punished with a deduction of one point during regular season for failing with licensing requirements. ^ "Ekstraklasa 2015/2016 - Kolejka 28". 90minut.pl. Retrieved 19 March 2016. ^ "(28. kolejka) Lech Poznań - Legia Warszawa". ekstraklasa.org. Archived from the original on 2016-03-29. Retrieved 19 March 2016. ^ "Ekstraklasa 2015/2016 - Kolejka 18". 90minut.pl. Retrieved 1 December 2015. ^ "(18. kolejka) KGHM Zagłębie Lubin - Jagiellonia Białystok". ekstraklasa.org. Archived from the original on 2015-12-08. Retrieved 1 December 2015. ^ a b "Analiza statystyczna Ekstraklasy 2015/2016". 90minut.pl. Retrieved 24 May 2016. ^ "Attendances – Archive Poland, 2015-2016, T-Mobile Ekstraklasa". EFS.co.uk. Retrieved 30 June 2016. ^ "Results table". 90minut.pl. 7 Jun 2015. Retrieved 7 Jun 2015. ^ "Ryszard Tarasiewicz odchodzi z Korony" (in Polish). 90minut.pl. 10 June 2015. ^ "Marcin Brosz trenerem Korony" (in Polish). 90minut.pl. 25 June 2015. ^ "Robert Warzycha i Józef Dankowski zwolnieni z Górnika" (in Polish). 90minut.pl. 13 August 2015. ^ "Leszek Ojrzyński trenerem Górnika" (in Polish). 90minut.pl. 13 August 2015. ^ a b "Thomas von Heesen trenerem Lechii" (in Polish). 90minut.pl. 1 September 2015. ^ "Dariusz Kubicki odchodzi z Podbeskidzia" (in Polish). 90minut.pl. 19 September 2015. ^ "Robert Podoliński trenerem Podbeskidzia" (in Polish). 90minut.pl. 20 September 2015. ^ "Henning Berg odchodzi z Legii" (in Polish). 90minut.pl. 4 October 2015. ^ "Stanisław Czerczesow trenerem Legii" (in Polish). 90minut.pl. 6 October 2015. ^ a b "Jan Urban trenerem Lecha" (in Polish). 90minut.pl. 12 October 2015. ^ "Kazimierz Moskal zwolniony z Wisły" (in Polish). 90minut.pl. 30 November 2015. ^ "Komunikat Wisły Kraków" (in Polish). wisla.krakow.pl. 30 November 2015. ^ "Thomas von Heesen odchodzi z Lechii" (in Polish). 90minut.pl. 3 December 2015. ^ "Dawid Banaczek: To dla mnie zaszczyt móc poprowadzić Lechię" (in Polish). lechia.pl. 4 December 2015. ^ a b "Romuald Szukiełowicz nowym trenerem Śląska" (in Polish). slaskwroclaw.pl. 7 December 2015. ^ a b "Tadeusz Pawłowski nowym trenerem Wisły Kraków" (in Polish). Wisła Kraków. 22 December 2015. ^ a b "Piotr Nowak nowym trenerem Lechii Gdańsk" (in Polish). lechia.pl. 13 January 2016. ^ a b "Tadeusz Pawłowski urlopowany" (in Polish). Wisła Kraków. 29 February 2016. ^ a b "Leszek Ojrzyński nie jest już trenerem Górnika!" (in Polish). Górnik Zabrze. 3 March 2016. ^ "Szukiełowicz odchodzi ze Śląska" (in Polish). Śląsk Wrocław. 9 March 2016. ^ "Mariusz Rumak poprowadzi Śląsk!" (in Polish). Śląsk Wrocław. 9 March 2016. ^ a b "Dariusz Wdowczyk trenerem Wisły Kraków" (in Polish). Wisła Kraków. 13 March 2016. ^ a b "Trener J. Szatałow zrezygnował z prowadzenia I zespołu" (in Polish). Górnik Łęczna. 6 May 2016. Archived from the original on 2016-05-06. Retrieved 2016-05-07. ^ a b c d "Lechia i Ruch ukarane ujemnymi punktami". 90minut.pl. Retrieved 6 February 2016. ^ "Kara ujemnego punktu dla Lechii wstrzymana". 90minut.pl. Retrieved 8 April 2016. ^ "Lechia wycofała skargę do Trybunału Arbitrażowego ds. Sportu". 90minut.pl. Retrieved 11 April 2016. ^ a b c d "Komunikat Komisji ds. Licencji Klubowych". 90minut.pl. Retrieved 24 July 2015. ^ a b c d "Górnik ukarany przez PZPN". 90minut.pl. Retrieved 24 July 2015. ^ "REGULAMIN ROZGRYWEK PIŁKARSKICH O MISTRZOSTWO EKSTRAKLASY NA SEZON 2015/2016 I NASTĘPNE" (pdf). ekstraklasa.org (in Polish). Polish Football Association. Retrieved 20 July 2015. ^ "Ekstraklasa 2015/2016 - Season rules". Scoresway. Retrieved 20 July 2015. ^ "Najlepsi strzelcy". ekstraklasa.org (in Polish). Archived from the original on 2016-03-03. Retrieved 27 July 2015. ^ "Najlepsi strzelcy". 90minut.pl (in Polish). Retrieved 14 September 2015. ^ "Patrik Mraz najlepszym asystentem Ekstraklasy". WP SportoweFakty (in Polish). 5 April 2016. Retrieved 6 April 2016. ^ "Gala Ekstraklasy 2016 - poznaliśmy #topESA!". ekstraklasa.org (in Polish). Retrieved 21 May 2016.